1. TRI's final version is out about two weeks old now, and especially Friedrich is engaging with the community on Steam. People write really nice, uplifting reviews, ask for hints in more difficult parts or write walkthroughs for the hidden idols. With pleasure we receive mails from people who played the game through or simply tell us how much they enjoy the game, its graphics and music. You guys rock and made the release a real delight for us! Meanwhile Friedrich also fixed some bugs and added hints to some level parts - release notes are here. The new version is already on Steam and currently uploading to all of the platforms where TRI is purchasable. Finally, I also created the Trading Cards, Backgrounds and Emoticons you will get while playing TRI on Steam. 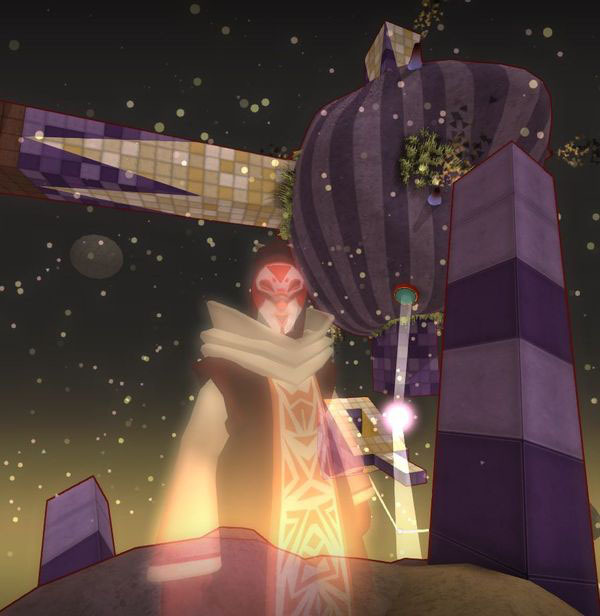 I have to admit that I should have created them earlier, right when we released TRI on Steam. I was never much into these cards and just archived those I got and sold doubles on the market. But while creating the images I engaged more with them and tried to craft badges and get backgrounds for my profile. It's a bit sad that I won't play most games that much to earn enough to create even more badges, but I guess they want you to use the market even more. The idea of getting rewards for playing to individualise your profile and receive coupons for a game you might not know yet is pretty intriguing. I think next time I take the cards more serious and create them earlier. 3. Aaaaand, last but not least: We are going to be in Poznan next week for the GameDev Convention and the Poznan Game Arena to showcase TRI and give a talk about puzzles. Like always I'm going to write afterwards about the event. 4. Oh, not to forget: we got featured in our friends weekly diary. Still Alive Studios included TRI in their Indie corner. In the last weeks, months, years and especially the last days there happened so much with TRI that we needed a little time-out and totally missed a realtime RELEASE announcement on our own blog. This is the catch up - we happily announce that WE DID IT. TRI is finished! Well, except for the trading cards on Steam and some minor bug fixes... A real game project - it seems - will never be really finished. And there is, of course, still so much work to do to spread the word on every channel and try to reach out more journalists and YouTubers to take a look at the game. Although - there are already some pretty cool reviews for us. I think the HardcoreGamer review, which also has an entry on Metacritics, nailed it: 4.5 out of 5! That was indeed a nice release gift for us! The Steam reviews and people telling us that they finished the game are the cherry on the cake after all the efforts. We also did an interview (in German) on the evening of our release with Manu from Insert Moin. Oh, and in case you wondered where this sneaky name extension ("Of Friendship and Madness)" comes from: one night before the release we learned that it is impossible to add TRI to curation lists. This is because if you try to find the game via auto completion, it rather chooses more popular games like Counterstrike for you instead of TRI - and the curator lists only work with auto completion. So that's why we added "Of Friendship and Madness". Just five days to go and TRI is available on your favorite games platform! Until then, have a look at our new trailer, featuring the monk's voice actor Harvey Cash with music by Ludwig Hanisch. 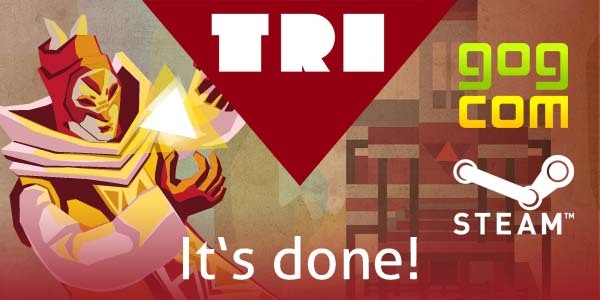 In September 2013 we put TRI on Steam Greenlight. Nearly one year later we opened our Steam store page. You can add the game to your wishlist now, if you like.